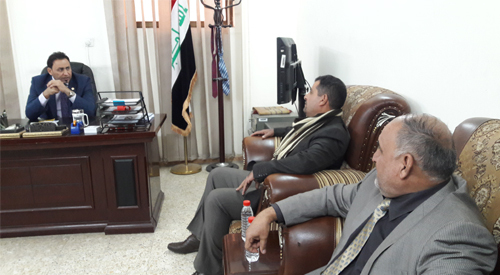 The First Deputy Speaker of the House of Representatives, Mr. Hassan Karim Al-Kaabi inspected the headquarters of the Central Committee to compensate those affected by military operations, military errors and terrorist operations in the General Secretariat of the Council of Ministers and briefed on the mechanism of its work and the rates of achievement and obstacles and needs. Al-Kaabi said during his meeting with the members of the Central Committee and the Executive Director on the need to develop a new mechanism to accelerate the resolution of the largest number of transactions affected in the liberated provinces. For their part, the members of the Committee welcomed the First Deputy Speaker of the House of Representatives and pointed out some legal and administrative obstacles and other matters that obstruct the work of the Central Committee and the subcommittees in the governorates. Al-Kaabi expressed his readiness to support the work of the Central Committee and sub-committees in the provinces and meet all their needs to accelerate the process of compensating the affected.